1 edition of The hole in the dike found in the catalog. Add another edition? Are you sure you want to remove The hole in the dike from your list? Published 1974 by Scholastic Book Services in New York . 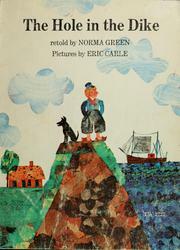 Retells the tale of the little boy whose resourcefulness and courage saved his country from being destroyed by the ocean. Adapted from a story which was first published in Hans Brinker; or, The silver skates, by M. M. Dodge. March 16, 2011 Created by ImportBot Initial record created, from Internet Archive item record.